Celebrating the Star Wars Universe! Aayla Secura – alongside many then-serving Jedi Generals – was murdered by her own clone troopers on Felucia when Supreme Chancellor Palpatine implemented Order 66. Anakin was seduced to the Dark Side of the Force by his desire – carefully fostered by Palpatine – to prevent his wife’s death in childbirth. Asajj was an assassin trained in the ways of the Dark Side by Count Dooku. She was later rejected by him and survived his attempts on her life: returning to her roots as a Nightsister and making her living as a bounty hunter. Boba – a genetic clone of his father – learned Mandalorian combat and martial skills from his earliest years. Coming to manhood, Boba succeeded his father to become one of the galaxy’s top Bounty Hunters, undertaking contracts for both the Empire and the criminal underworld. C-3PO was a protocol droid constructed by the young Anakin Skywalker on Tatooine. C-3PO served the Skywalker family faithfully for generations in the Rebel Alliance and Resistance movements. Senator Palpatine was a daring and cunning politician, who lived a double life as Sith Lord Darth Sidious. Palpatine connived at the overthrow of his predecessor to promote his own bid for the Supreme Chancellorship: which he used in turn as his stepping stone to Empire. Chewbacca joined with his fellow Wookiees to resist the termination Order 66 then being effected by Clone Troopers: saving Yoda’s life and seeing him safely off-planet. After unsuccessfully resisting the Empire takeover of his homeworld Kashyyk, Chewbacca took up smuggling with Han-Solo before later joining the Rebel Alliance to continue his fight against the Empire. Produced en masse in the production lines of Kamino, Clone Troopers were accelerated in large batches to become the ground troops of the Old Republic. Unquestioningly loyal to their chain of command, Clone Troopers proved themselves far superior to battle droids, and became the backbone of the Empire’s ground and security forces. Trained by Yoda himself, Count Dooku became disillusioned with the Jedi and turned to the Dark Side seeking greater power. Dooku served as Darth Sidious’ apprentice, front-man, and general during the Separatist wars: until his ultimate betrayal by his Sith master. Cut Lawquane was one of the rare Clone Troopers who chose to desert and begin a new life for himself in the galactic finge. Lawquane married and settled on Saleucami, hoping to avoid the ravages of war then sweeping the star systems. Cylo was a doctor and cybernetics specialist employed by Emperor Palpatine to restore Darth Vader from his injuries sustained on Mustafar. Cylo’s ongoing research into cybernetic-enhancement and lifespan-prolongation received funding and support from the Emperor. Taken from Dathomir and trained as Darth Sidious’ apprentice, Darth Maul became a formidable Sith Lord in his own right, until his fatal duel with Obi-Wan Kenobi. Or was it fatal? Rumours of Maul’s return and reconstruction are whispered throughout the underworld: along with his undying hatred of Kenobi. A Jedi of considerable promise, Anakin Skywalker’s fears and frustrations prompted him to chose the Dark Side, becoming Darth Vader. Anakin feared his wife’s death in childbed and concluded only the power of the Dark Side would prevent it; while simultaneously believing that only by becoming a Sith Lord would he circumvent the Jedi Council’s continuing to block his rise to power. Dexter Jettster’s colourful background made him an ideal and reliable informant for his friends. Though now a restaurant owner on Coruscant, Jettster had formerly seen much of the galaxy as a prospector, smuggler, gun-runner, and mercenary. Droidekas deploy to the combat zone in discus mode, transforming to their tripod mode to hold ground and engage the enemy. In tripod-mode, droidekas encase themselves in spherical force-shields while laying down punishing fields of cross-fire from twin heavy blasters. 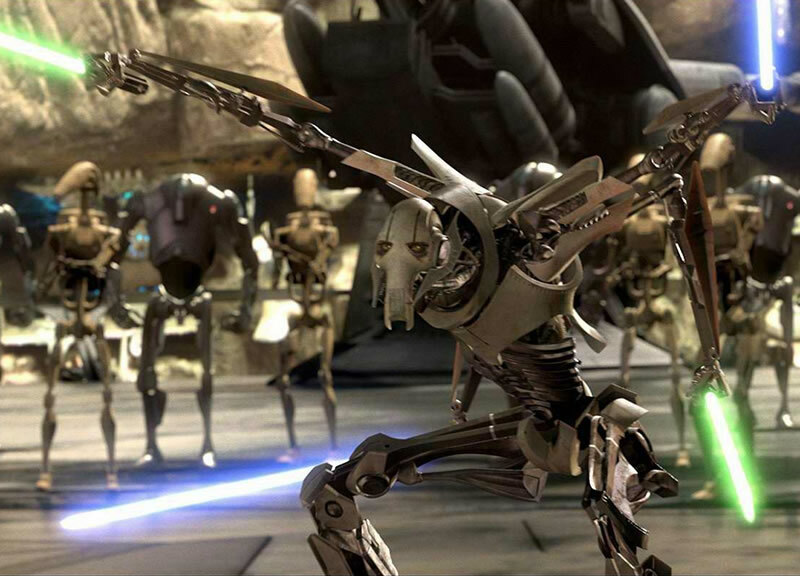 Raising himself from Kaleesh warlord to cybernetically enhanced cyborg General, Grievous came to Count Dooku’s attention and was recruited to lead Separatist armies againt Republic forces. A brilliant strategist, Grievous developed his own style of light-saber combat, becoming a ruthless Jedi hunter. A Rodian Bounty Hunter on Tatooine, Greedo took periodic contracts from the local crime lord Jabba the Hutt. While Greedo excelled at bullying those weaker than himself, he was a decidedly minor player in the big leagues: and apt to quickly find himself out of his depth. Han Solo was a smuggler intimately familiar with the well-traveled – and not so well-traveled – galactic routes between star systems. Caught up in the galactic wars then raging, Solo chose to side with the Rebel Alliance against the Empire: proving himself a capable and daring starship pilot aboard his customised Millennium Falcon. Jabba the Hutt was one of the more influential and powerful crime lords operating in the Outer Rim. Jabba’s organisation was based on Tatooine, and controlled extensive smuggling, piracy, and slavery operations. At the apex of his career, Jango Fett was Bounty Hunter and assassin-for-hire par excellence: with a well-earned, galactic-wide reputation as one of the best in the trade. Jango was paid by Darth Tyranus to provide his genetic information to be used to manufacture a clone army on Kamino. K-2SO was manufactured as an Imperial security droid. Captured and reprogrammed by Captain Andor, K-2SO became Andor’s co-pilot in flying missions for the Rebel Alliance. As a Jedi Master, Kit Fisto generaled clone armies during wars with the Separatists and participated in many special operations. As a member of the Jedi High Council, Fisto was present when the Supreme Chancellor was identified as a Sith Lord at the end of the Old Republic period. Hidden by Obi-Wan Kenobi on Tatooine in the Outer Rim to escape the attentions of the Empire, Luke Skywalker grew up in obscurity as an orphan ignorant of his parentage. Made homeless after a brutal Imperial raid, Kenobi offered to get Luke off-planet, while commencing his introductory Jedi training. Mace Windu was an experienced Jedi Master and member of the Jedi High Council on Coruscant. Windu served with distinction during the Clone Wars as general in various operations, and grew increasingly suspicious of the attempts of Chancellor Palpatine to aggrandise supreme power to himself. The Magna Guard droids were specifically manufactured as to provide bodyguard and specialist infantry services. Magna Guards were used as bodyguards by General Grievous and other senior Separatist leaders, and were designed with multiple-redundancy circuitry to maximise their operational combat effectiveness. Obi-Wan Kenobi became a key figure in the last days of the Republic, before the rise of the Empire. Before becoming a member of the Jedi Council, Kenobi had trained and mentored Anakin Skywalker – believing him to be The One prophesied by Jedi oracles to restore order to the Force. Padmé Amidala served respectively as both constitutional Queen, and later Senator, of Naboo. From her clandestine marriage with Anakin Skywalker, Amidala bore twins (Luke & Leia) before dying shortly afterwards. A maverick Jedi who worked best outside traditional lines of authority, Quinlan Vos combined expert tracking and combat skills with his Kiffar retro-cognition ability to perform many special operations for the Jedi Order. Vos preferred working solo: his missions often taking him into dangerous corners of the criminal underworld. Astromech droid R2-D2 faithfully served Padmé Amidala, Anakin Skywalker and Luke Skywalker in turn. Although programmed with default starship mechanic and navigator skills, R2-D2’s hardware has been successively augmented over time to allow him to fulfill a variety of specialist roles for the Rebel Alliance. Taun We serves as administrative aide to the Prime Minister of Kamino, in Tipoca City. Taun We shares her Kaminoan people’s expertise in genetic engineering, and was familiar with all aspects of the most recent Repbublic contract for over 1,000,000 Clone Troopers. Jedi Master Tholme trained Quinlan Vos as his Padawan during the Clone Wars – later using Vos to assist in setting up a spy ring to penetrate the upper circles of the Confedercy of Independent Systems. Tholme’s previous training on Anzati served him in good stead in evading Order 66: allowing him to make his way to refuge on Kashyyk. Yoda was a legendary Jedi Master who rose to head the Jedi Council on Coruscant, while continuing to train younger Jedi knights for 800 years. Though strong in the Force, he was bested in combat with Darth Sidious: causing him to seek safety in exile on Dagobah. Zett Jukassa was one of many youngling Padawans in the Jedi Temple the day Darth Vader forced entry with a battalion of Clone Troopers to carry out Imperial Order 66. Jukassa was gunned down on one of the upper landing platforms of the temple before the horrified eyes of Senator Bail Organa.